We are delighted to offer this unique oceanfront property on Penobscot Bay for your family's vacation. This property features a large front room with dinning table and chairs and seating area, living room, kitchen. upstairs features open loft, master bedroom with curve ceiling whirlpool tub, and two smaller bed rooms and another full bath. Most rooms have fabulous ocean views, contemporary style, open, wood ceiling…. There are several beautiful gardens surrounds the house. The lights from sunrise and sunset are most exquisite reflecting the magic of Maine coast. There are two kayaks for experienced kayakers to use and also two bicycles. 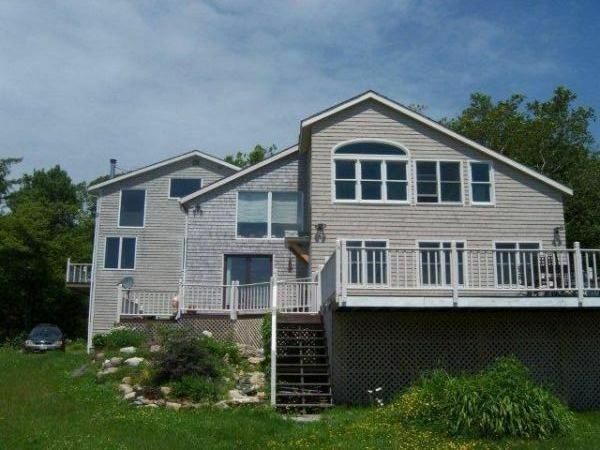 This property is conveniently located between Acadia National Park and Camden Hills. There is a peaceful state park and historic lighthouse just half-a-mile from the house, and a 200-foot dock for fishing. Visiting families often spend time collecting sea glass, seashells, and mussels in front of the house. Many families revisit my vacation home, one family came back for seventeen years. I am very happy to share this special place with you and your family. retired financial analyst, restaurant owner, ceramic artist.......who loves nature, zest for life. 1/3 mile of walking distant to the 55 acres of Fort Point park. A fabulous dock you may fishing from. 2 queen, 2 twins, 1 sleep sofa. The views from this home are breathtaking! The pictures really don't do it justice. It sits on a bluff overlooking the bay where you can see coastal cliffs to the south, ships sailing right past the deck, seals frolicking all day, and beautiful sunsets. The property is huge, very private, and quiet. There is a staircase down to a rocky beach where you can launch kayaks, swim, and collect shells and sea glass. The house is very nicely furnished and equipped, clean and comfortable. The house is conveniently located to many beautiful coastal Maine areas of interest including Acadia National Park, Belfast, Bucksport, Camden Hills State Park and numerous harbor towns, while at the same time Stockton Springs and Lighthouse Road are extremely quiet and peaceful without hoards of tourists everywhere. I would recommend visiting Stonington, a very cool fishing harbor at the southern end of Deer Isle, where you can see hundreds of lobster boats coming in with their haul. It is a pleasant change from the hustle and bustle of Acadia and Bar Harbor in peak season! Susie is an awesome host. She greeted us upon arrival and made sure we had everything we needed and recommended places to explore. Even though she lives on the property we never felt a lack of privacy. She is so kind and also quite a talented artist. If you care to chat be sure to go see her at work down in the garage creating her glass masterpieces-they are very beautiful. We even purchased one as a very special souvenir to remember our stay in this Waterfront Wonder! A Relaxing Two-week Stay for Us. Good location which makes it possible to take day trips to many places. We especially enjoyed Acadia National Park (to the North) which is a must, and the other direction, (South) gives you Camden, Rockland, and beautiful coastal drives. We loved the small fishing villages...our favorite was Stonington. A busy harbor with only 1000 residents but over 300 lobster boats. The house is close to Young’s Lobster Pound where you can take a cooler and bring home fresh live lobsters, clams, or mussels to steam in the well-equipped kitchen. It’s wonderful to sit on the big deck and watch the boats go by. The view is incredible. The house is “in the country” so ultra quiet and private. The house is very open and bright so star gazing from the upstairs master bedroom is a delight. The owner is most gracious and invited us to pick things from her garden....including bowls full of delicious raspberries. We also picked bouquets of fresh flowers from the yard. A great choice for enjoying Northern Maine. Attracted to this property by the pictures on VRBO. Not disappointed. Everything as was represented. Quiet location. Beautiful view of the bay. Plenty of room for the number of occupants including 2 socializing areas and a large kitchen area with large countertop to work and eat at. Totally enjoyed the stay. Awoke each morning, without lifting my head from the pillow, to a spectacular view of the water and scenery. Sat each morning, with family, on the porch listening to the birds and watching for seals. Hated to leave at the end of vacation. My family and I loved this home. It was comfortable and clean and we were welcomed by the owner on our arrival. The views were amazing. The house was well equipped and we had everything we needed or wanted. We all wished we would have had more time to to extend our vacation but if we ever find ourselves in Maine again, we will be sure to book this house again! Thanks Susie! Our family has been visiting relatives in Maine for the past few years and we decided to try a rental property vs. the cottage/hotel option. We were very pleased with our choice in this spacious, oceanfront home. The views from the master bedroom, living room and dining room were more beautiful than the pictures show. The other two bedrooms each offered skylights and an opening with drapes overlooking the interior lower level. We found everything we needed from towels to teacups! The gardens and lawn to the ocean cliff offered peaceful walks and views. You can take the stairway to the rocky shore below and you are in your own little world. We were torn between visiting area sights and relaxing on the sunny deck watching lobster boats, cruise ships, seals and the sun sinking beyond the coast. It was nice being on a dead end (Ft. Point lighthouse is at end of road) where we could walk and ride bicycles with little to no traffic. We spent one week, with incredibly perfect weather, in an ocean front vacation home... priceless! We were looking for great family time in a peaceful relaxed spot. We got more than we asked for. The views were gorgeous, and the owners did a fabulous job taking care of every detail. They were extraordinarily accommodating, and even rescued us when we had a flat tire. They were wonderful to work with. We took advantage of kayaking in the kayaks, biking in the state park. There was not enough time to enjoy it all. There was a wonderful fire pit, along with marshmallows and chocolates for smores. We thoroughly enjoyed ourselves and im sure anyone would enjoy this home. Hiking, biking, kayaking, walking. 1/2 Mile to Fort Point State Park and Lighthouse. 6 Miles to Fort Knox Historical Park. 12 Miles to Belfast, quaint village offering art studios, shops, and restaurants, sightseeing, and kayaking tours. 30 Miles to Camden, Mt. Battie state Park, fine art galleries, and fine dining, kayaking, biking, sailing. 40 Miles to Bar Harbor and to Acadia National Park, the only National Park on the east coast of the United States.